Are you yearning to embark a self-sufficient lifestyle but can only afford to buy or maintain a 1-acre homestead? Well, pull on some work work boots and gloves, it is time to turn that dream into a fully-functional reality! Sure, the more land you own the more you can grow, raise, and hunt for your own food. But, it is both entirely feasible and extremely economical, to homestead on just a single acre of land. Before finally finding our dream homestead – 56-acres of fertile ground and beautiful woods to work, we homesteaded on a less than 1-acre corner small town lot. While we did not grow and raise all of what we ate, we did vastly reduce our dependence upon the grocery store and modern medicine by cultivating crops, herbs, and small livestock. Had we used up every inch of available growing space, which can actually be done in an extremely attractive manner (perfect for suburban homesteaders) and we didn’t love steak, we could have grown and raised enough to food to be completely self-sufficient on just 1-acre of land. Before you can determine how much crop growing space you will have and design the plots, you must determine the dimensions of the home you are going to build on the 1-acre homestead, if purchasing vacant land. The home will be the largest space-taker on the homestead, but can also be used as a space to vertically garden and to start seeds indoors during the winter. 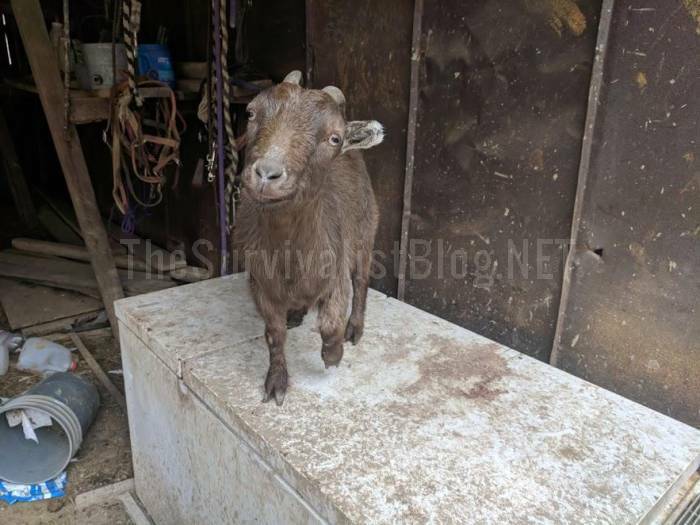 Kept two small goats – one pygmy meat goat (he was a billy used as a stud and for weed control – a massive landscaping maintenance time-saver) and a Nigerian Dwarf milk goat. Both are about the same size as our dogs. Kept ducks (they had a garden pond for swimming but a baby pool would work too) for eggs and meat if the SHTF. 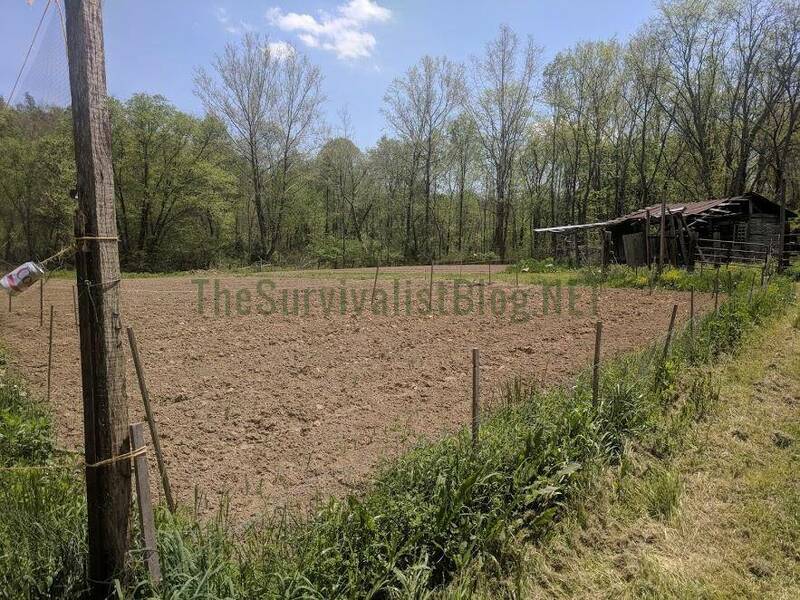 We only opted not to turn our property into a complete homestead because we were selling it and our rental property next door to fund our dream homestead. Some potential buyers unfortunately, simply would not appreciated the value of vertical gardening planters running up the sides of the home and a larger goat pen in the backyard. Before we delve too deeply into how to set up a homestead on 1-acre of land, let’s make sure we understand both how much ground we are talking about and exactly what makes a homestead. • One acre is officially described as a parcel of any rectangular plot of land giving that encompasses a total of 43,560 square feet. • One acre is comprised of 6 plots that measure six feet by 120 feet. • One square acre is about 69.57 yards. • One square acre is 208 feet by nine inches on a side. • Acres do not have an specific shape. Any area that is 43.560 square feet is 1-acre. 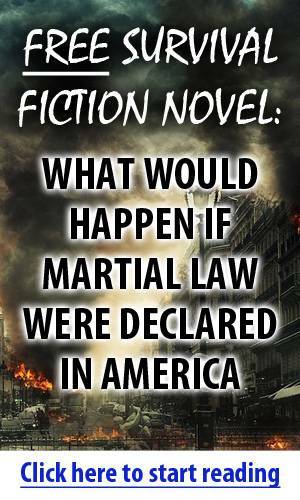 • One acre is a little bit larger than a football field. A football field measures 57,600 square feet, when including the pair of 30-foot-long end zones. When not including the end zones in the easy to visualize comparison, a football field measures in at 48,000 square feet. When you break down exactly what one acre is, you begin to understand exactly how much space you have to work with. That knowledge will help you plan the dimensions of the livestock housing, raised garden beds, and even the home, that you want to built. A homestead is not a farm nor is is merely a small town or rural residence – not entirely, anyway. Farm operations typically require the use of tractors and heavy agricultural equipment that is not necessary to operate a homestead, unless doing so it by choice for convenience on a large-acre homestead. My husband LOVES the vintage tractor we worked into our purchase deal and would surely argue that a tractor is essential to our homestead, especially when it comes to keeping up the ½ mile dirt uphill driveway that leads from the road to our home. Sustainability is a crucial aspect of homesteading and not necessarily a major factor in farming – unless by choice to conserve resources, time, and money. Factory farms, which are rapidly replacing the American family farm, are surely not focused at all on the sustainability of their operations. Homesteads (which are sometimes now referred to as farmsteads) are primarily created or personal food production needs and not for money-making purposes – although a clever homesteader will find ways to make money from the excess the land provides and through creative endeavors so they can work from home and/or bolster the family income to pour back into their homesteading efforts. The dimensions of the home are extremely important when dividing up the 1-acre parcel for homesteading purposes. The larger the home the less ground space there will be for homesteading. If you need a large home consider going up (second floor) or down (basement – which can double as a root cellar) to garner the additional square footage desired. Our daughter and son-in-law turned an Amish wood shed into a tiny house and put it on a portion of our homestead. They got very creative with storage space – they have three kiddos under four years old. They made a great sustainable lifestyle choice to rid themselves of unnecessary material things, so their children could enjoy living an outdoor life up on our hill. Their cabin is 500 square feet. More and more often Amish wood sheds like these are being turned into economical tiny houses. The shed cost around $7,000 and they put about $3,000 into finishing it out. Most of these sheds come with one or two loft bedrooms. They will eventually build a home on our property as the children grow, but for now they are living debt free and have a lot more space to make use of in the portion of the land that they have claimed as their own. A “barn” is not necessary for small to medium livestock, at least not in conventional terms. A poultry coop, shed for small goats, and hutches for rabbits is all that is necessary. Construct a livestock “village” to keep the animals conveniently located together for feed, food storage, and to gather their waste for composting. Our chicken coop,brooder, and rabbit cages occupy the same area to conserve space, even though we live on a 56-acre homestead. 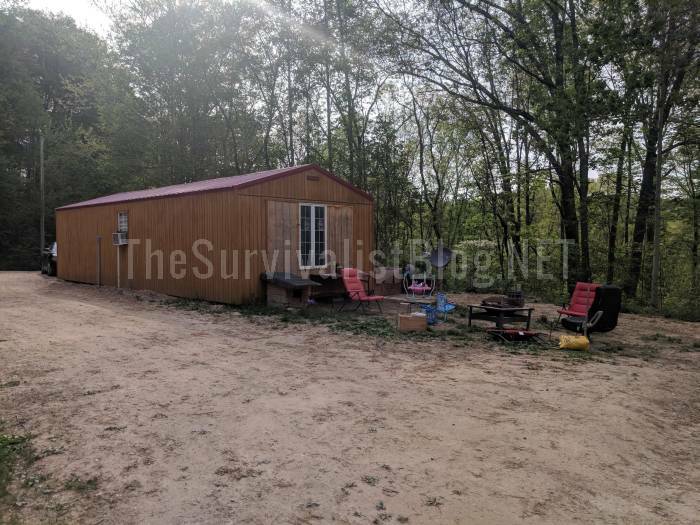 By being conservative with our homesteading design plan we have been able to decrease manual labor hours by the sheer location of the animal housing and storage units being in close proximity to one another. A storage shed is built onto the non-visible side of the chicken coop and our largest compost pile is located adjacent to it – I was actually kind of standing in it. 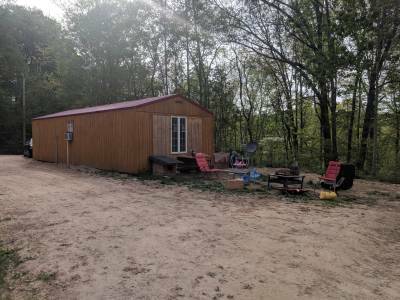 The barn is located within an easy softball throw of the coop and hutch area, making it easy and quick to combine all of the manure together in one centrally located compost pile. To take advantage of all the space you can, grow vertically on the house, outbuildings, wood privacy fence, and even indoors if the windows allow in sufficient light. 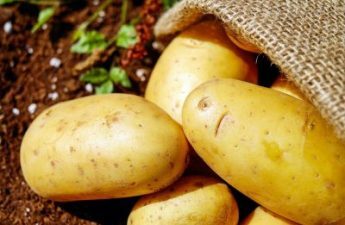 Also grow crops in landscaping beds around the home, in containers both indoors and out, in both ground and raised bed plots, hanging baskets and hanging planters off windowsills, porches, swimming pool decks, etc. Consider growing dwarf fruit trees because they take up a much smaller space than traditional trees and many can even be moved indoors during the winter. Grow berry bushes as decorative landscaping and property border dividers, and cultivate fruit like strawberries in hanging baskets. Our orchard encompasses about 400 square feet and is located in the middle of our upper pasture. 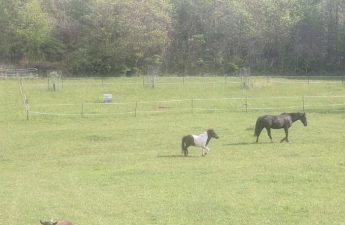 The electric fence around the area keeps the horses and goats away, and took only an hour to put up. One of our beehives is located inside the fruit grove to facilitate the best pollination possible. We also grow non-native dwarf fruit trees and bushes in containers so they can easily be moved indoors when the weather turns cold. On a suburban homestead, make the property more sustainable by setting up a rainwater collection system and digging a garden pond to ensure the animals and crops will receive water even during an emergency or drought. 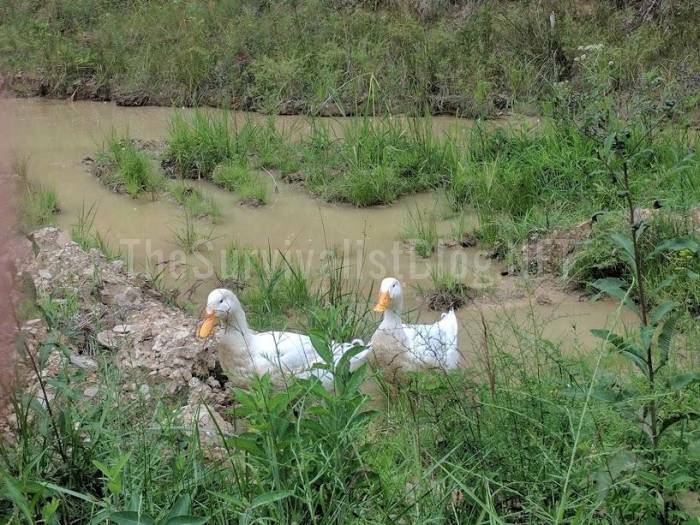 It is highly advisable to only purchase a rural 1-acre homestead if it has a stream or spring fed pond. If neither exist, find a spot that will support a pond and dig it yourself, even if it has to be small and even if a well exists or is being drilled on the property to provide water for the home for the reasons noted above. Our homestead has a creek that runs through it that only ran dry for a few weeks during an intensely hot summer, but we dug a pond as a secondary water source for backup anyway. It is more centrally located to our home and the barnyard than the creek. Even on a 1-acre homestead, you can dig a small pond at least four but preferably six feet deep and stock it with a few fish to increase the protein sources on your homestead – and use it as a free watering source for your livestock and watering the garden when necessary. On a 1-acre homestead a woodlot is not likely going to be possible, so factor in a woodshed and indoor storage area for purchased or bartered for firewood if you have a wood stove or fireplace…which you should. Wood stoves are far more efficient than a fireplace. There are quite a few different styles of wood stoves to choose from, some of which also function as cookspaces or even boast full oven style cooking. You simply cannot overestimate the value of a quality wood stove on the homestead. 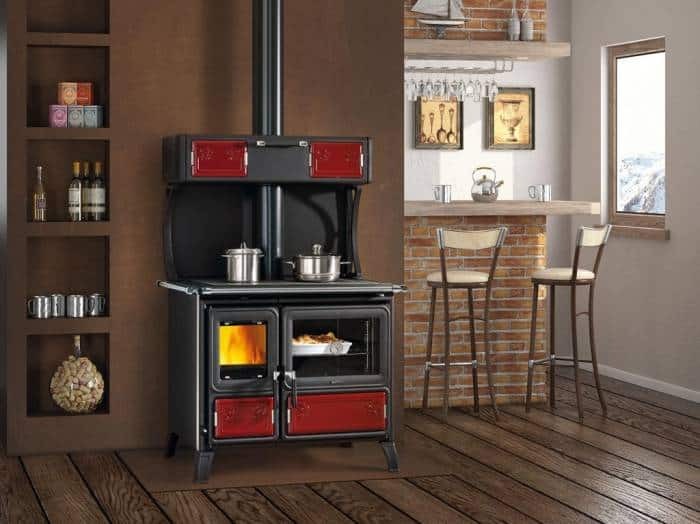 This wood cookstove is just about any homesteader dream home appliance. It will heat your home, AND make your dinner! Talk about energy efficiency. Many folks rightly believe that food prepared on a grill, in a smoker, or over an open flame is the best way to way to eat a meal. Wood cook stoves like this one allow you to enjoy that same delicious taste even on the coldest of days without having to step a foot outside. Photo used courtesy of Woodcookstoves.com. 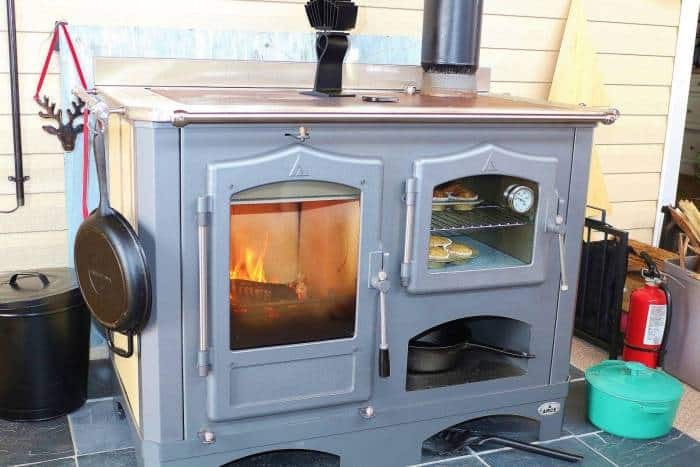 If you are homesteading in the suburbs and want a wood stove, and maybe even a wood cook stove, but need a unit that will blend in with your less-rural decor? A few suppliers make something that will suit your aesthetic and homesteading self-reliant desires. I think the unit in the photo below is a true beauty. Yes, I love wood stoves. I love the smell of the burning wood, the sweet fragrance of homemade potpourri wafting from a tiny cast iron skillet I put on top during the winter months, and cooking in them year round. Just thinking about using my grandma’s recipe for homemade biscuits cooked inside of our wood cook stove makes my mouth water! This photo was also courtesy of woodcookstoves.com. I you raise them, you have to be able to graze them. Unless you want to purchase copious amounts of hay, do not purchase more animals than can eat the grass on your 1-acre homestead except during the winter months. During the winter goats will still be able to browse for their food, but will still need to consume hay to remain healthy. You can make either a small permanent or temporary seasonal greenhouse using clear plastic sheeting and PVC pipe or wood to start seeds and extend the growing season. Both sheds to house livestock feed, supplies, and gardening tools as well as interior storage (consider a root cellar) for preserved food, will be necessary on a homestead of any dimension. The ability to use alternative energy to become more sustainable will likely be drastically limited if the 1-acre homestead is in a suburb or even a small town. If the homestead is in a rural non-municipal area using solar power, setting up a wind turbine, or a hydro-power system – or a combination of all three, will be far more feasible – and perhaps necessary to have any type of a power source. If living inside a municipal corporation you could limit your dependency upon traditional utilities by putting in a wood stove, fireplace, and using wall-mount propane heaters. Standard home appliances, like a stove, refrigerator, and hot water tank, can also be purchased in propane-gas ready varieties. If a wood stove is installed, it is possible to use it as a hot water heater. Exterior wood burning furnaces could also be used to heat the home and water. For beginning homesteaders or farmers, goats and chickens are highly recommended. These types of livestock are generally simply to raise because they are largely low maintenance critters – and are multi-purpose animals. Chickens provide both eggs and a meat source. Goats provide both milk and a meat source. If the livestock housing units are located close together, a single large compost pile could be created. Ideally, a small compost pile next, inside of, or underneath each housing unit (in the case of rabbits) can be a big time saver, especially if the livestock village is placed next to the primary growing plot. Pekin and Rouen ducks wandering around our homestead from the coop area to the pond for a swim. All of our animals intermingle together without incident, injury, or illness. I believe allowing them to be exposed to their natural environment better protects them from disease and illness than being kept in a confined space. Yes, we do lose some flock members to predators, but fewer such heartbreaking deaths happen on our homestead than do those operated by friends who engage in only coop and run living arrangements. All four types of poultry birds listed above will have enough space to live, lay eggs, and reproduce if provided a coop and a spacious run on a 1-acre homestead. I have always kept chickens, ducks, and guineas in the same brooder and then the same run until they were large enough to free range. I highly recommend free ranging because it is a more natural environment and in my personal experience, creates more hardy birds. I trained our flocks to go up at night by tossing some fairly healthy snacks to get them to follow me just once. Each following night the birds “flocked” to me or were waiting in the chicken run to be let into coop, by dusk. Guineas are loud, I mean really loud, when they sense danger is lurking nearby. 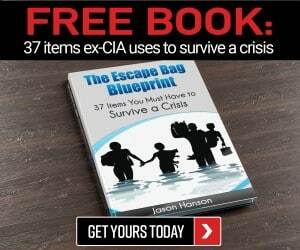 While this is great for a rural 1-acre homesteader who will be dealing with various types of predators on a constant basis, this could be really bad news for suburban or small town 1-acre homesteaders. They are not good eating and neither are their eggs. But, guineas are the guard dogs of the poultry world and will help keep your meat and egg flocks safe. They are weird looking to be sure, but they are hilarious to watch get excited and chase snakes, mink, etc. 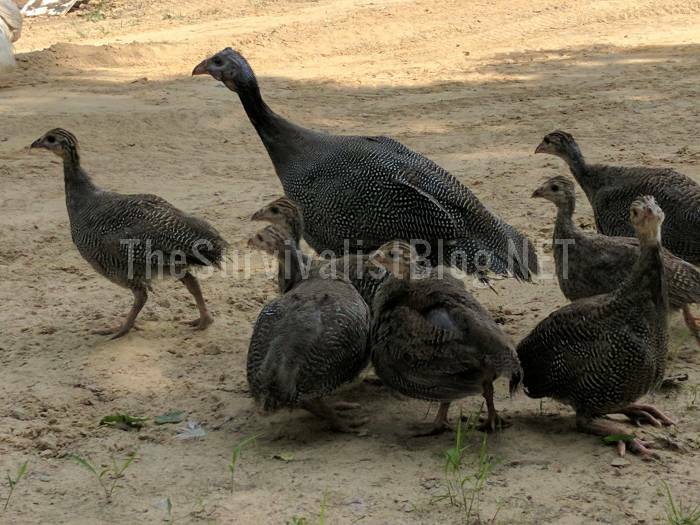 Turkeys can get a little loud as well and because they are far larger than chickens, ducks, and guineas, will need a larger space to roam – be it a pen or free ranging. You can keep turkeys on a 1-acre homestead, but will have to satisfy yourself with a smaller flock or butcher them on a regular basis. Domesticated ducks will not – cannot, fly to any real degree and have no urge to “fly away for the winter.” We keep Pekin ducks almost exclusively now because they are great meat ducks and lay delicious eggs. Unfortunately Pekin ducks are lousy sitters, so sneaking some eggs under a broody hen or into an incubator, will likely be necessary to replenish the flock. 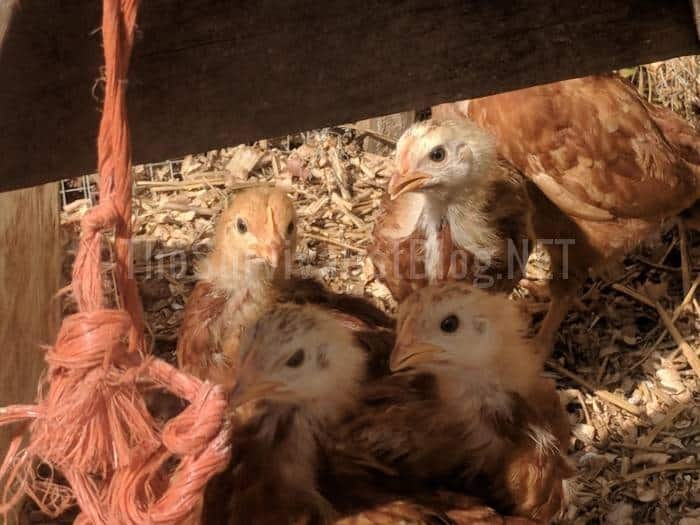 Rhode Island Red chicks enjoying a relatively natural life in the chicken run until they are large enough to release to free range with the rest of the flock. 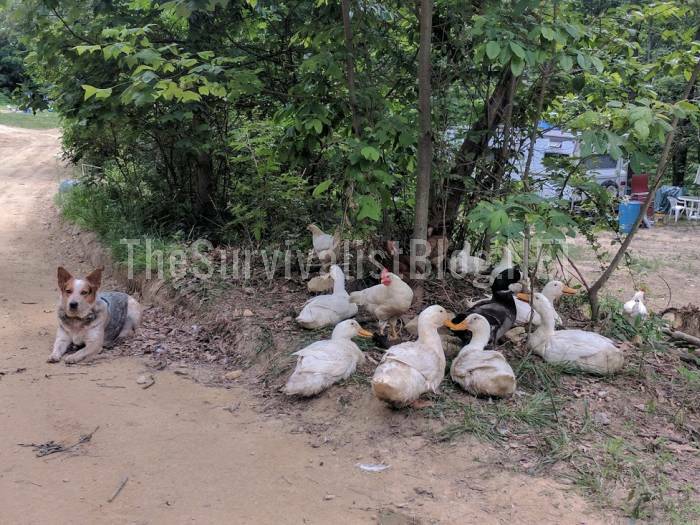 Our lead guinea, Carol, is quite the mother hen even though she had never had keets (guinea for chick) of her own and keeps a close eye on all new little ones in the barnyard. Some chicken breeds are quieter than others and roosters are obviously more noisy than hens. If you are living with neighbors, consider adding one of the quiet breeds noted below to your 1-acre homestead. Both Pygmy goats and Nigerian Dwarf goats are ideal for small homesteads, even a 1-acre homestead. 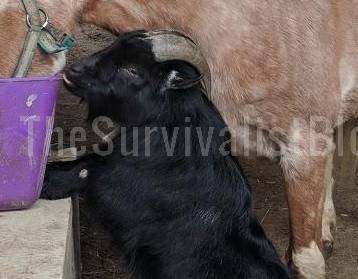 Nigerian Dwarf goats can produce up to 1-half gallon of milk on a daily basis 10 months out of the year. Goat milk is incredibly sweet and can be used at the same amounts as cow milk in recipes. Of course a standard goat will produce more milk, but they also take up more space to house, need more room to roam and “browse” for their natural feed, and cost more to feed. This is a billy Pygmy goat. I was initially afraid of his horns, of goat horns in general, because I had not experience with goats. But, the free and cheap goats that were offered to us had horns and needed a good home. I am so glad that I did not purchase a young goat and have it debudded (horn removal) out of misguided fear. Without horns, a goat has no way to protect itself from predators both wild and domestic….stray dogs. Typically, both Pygmy goats and Nigerian Dwarf goats live about 15 years. Their weight generally averages between 50 to 85 pounds. Both breeds reach maturity around two years of age. 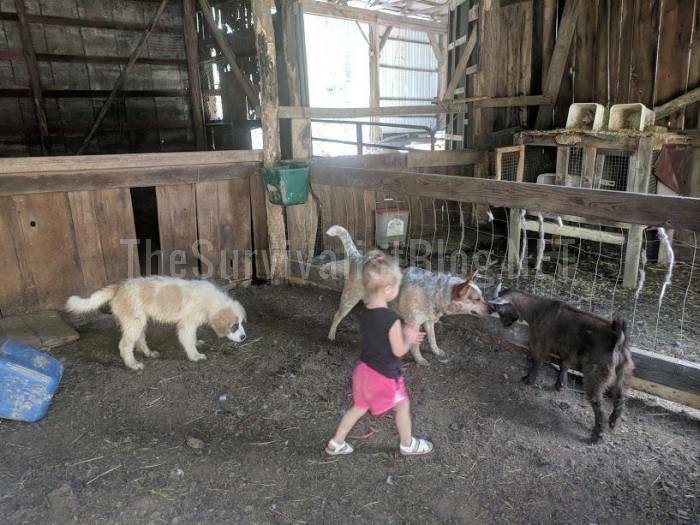 As you can see by this photo, our goats are about the same height and weight as our herd dog, Jovie – a blue heeler and livestock guardian dog, Sasha, a Great Pyrenees and St. Bernard mix. It is also easy to see how gentle our goats are. Auddie, our 2-year-old granddaughter, plays with them without fear – or causing grammie to be concerned about her safety. If you have never kept goats before, either of these breeds or a combination of the two, would be ideal. Both are known to be docile breeds and are often handled by young 4-H children when they are first learning how to keep and show livestock. Pearl, the baby goat’s momma, is a Nigerian Dwarf goat. She lost an ear and the use of a leg during a dog attack, but recovered and gets around great on three legs now. Rooster, the kid in the photo, was her first kid. Before she got a mate, she would hang out all day with our blue heeler, even napping together at my feet when she snuck into the house through the back door. 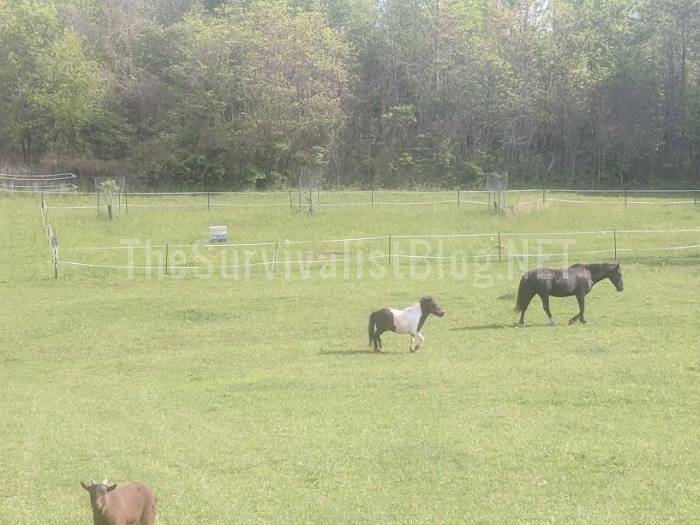 These are another great small livestock for a homestead on minimal acreage. You can use hanging cages, a traditional freestanding rabbit pen or go the semi-free range route and built a “rabbit run” around the freestanding pens so the animals can eat a more natural – and free, diet. A “chicken tractor” can be made cheaply out of PVC pipe, chicken wire, and lawn mower wheels. 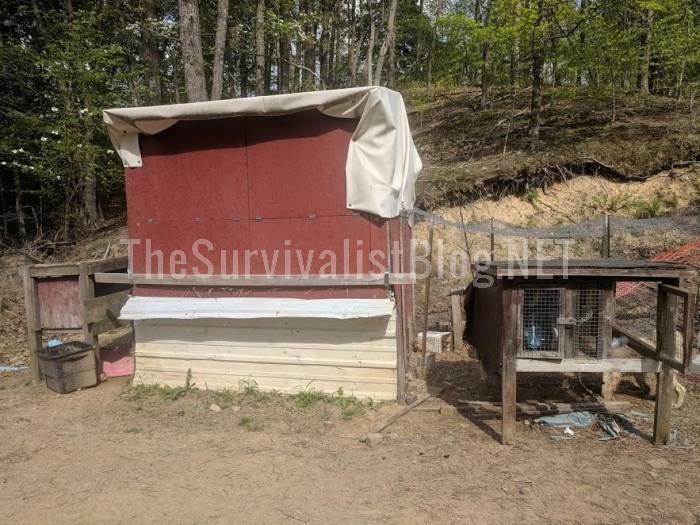 The chicken tractor can be used to contain the small livestock while they earn their keep eating grass, weeds, and bugs around the 1-acre homestead Anytime you can find a way to save money and time on the homestead should be considered a huge win. These are a type of large livestock, but unlike horses and cows, do not need either a larger or quality pasture to be kept humanely. Two feeder pigs, also referred to as “weaners” can be kept in a pen that is only about 10 feet by 7 feet. Their simple shelter would take up about 5 by 7 feet of their pen. The more the hogs wander about, the more weight they lose and that is definitely not the goat for a purely meat animal. The pen must be sturdy, very sturdy, or the hogs will push and nose their way out. The pen must include a mud wallow so the hogs can keep cool. The ground inside the hog pen compound will make excellent composting material for your growing plots. If the home on the 1-acre homestead is not large, it is possible to cultivate a ¼ of an acre ground plot garden on the property. In addition to the large garden, there is also enough space left to grow in traditionally landscaping areas around the home, put up a small greenhouse, grow vertically, in containers, and in hanging baskets. If you are new to homesteading, it would be best to start with a smaller ground plot. Gardening is a lot of work, large gardens are a whole lot of work. You must love it and have the time to devote to it, to produce a bountiful harvest. Easy to grow crops that can be cultivated in the ground or in containers would be a great place to start. Do not over-extend yourself the first year on the homestead. 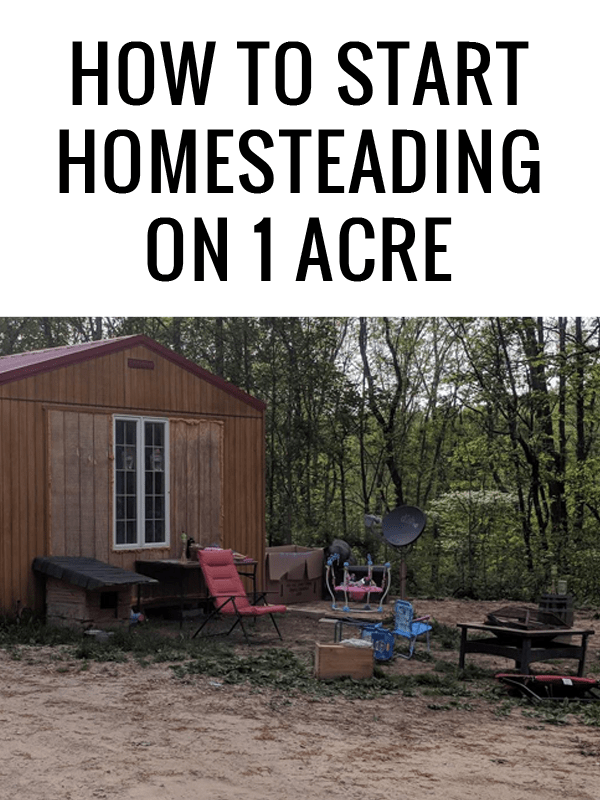 As exciting as it is to finally get homesteading, no matter the how much or how little land you buy, there will be a ton of work to do to get started and a daily chores to complete. 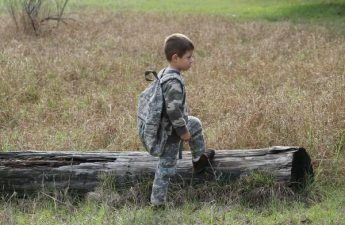 If the 1-acre homestead is in a suburban area, you will not likely be chopping wood, hunting, fishing, foraging, and dealing with wild predators on a daily basis like rural homesteaders. But, you are more likely to work away from the land and have commuting time to deal with that will reduce how much time you can spend tending to the growing crops. Rotate your ground growing plots annually to deter the depletion of the soil and to help prevent pests from congregating in the area around specific crops, and to decrease the chances of spreading disease from plant that develop a fungus. If possible, allow your livestock to dine in the dormant areas to help replenish the nutrients in the soil with their manure. Grazing livestock on dormant plots works the soil and adds back nutrients from manure droppings. Plowing grass, clover, and vegetable waste, into dormant ground, enriches the soil for the next planting. While you are excitedly planning your garden, how to increase growing opportunities in and around your home and purchasing livestock, do not neglect to factor in the space and expense storage and outbuildings will require. Even though you may not need a traditional barn, you need not only housing units for the livestock, but space to store their feed, hay, and straw, gardening tools, typical home improvement tools, a woodshed, a root cellar or basement space for preserved food storage, inside storage space for canning and dehydrating equipment, and perhaps even a smokehouse and butchering area. You could opt for one large shed, but smaller sheds that are centrally located to the areas in which the items stored inside will be used, could be a time, money, and space saver. For example, using the exterior wall of the chicken coop for the back of a storage building to house the feed, bedding, and emergency first aid items used to care for the birds will save some manual labor while allowing you to complete the necessary chores more quickly – something you will appreciate during inclement weather. Turning a porch, patio, or deck into a summer kitchen for canning, drying, and dehydrating the crops and meat your cultivate would be another excellent use of space on a 1-acre homestead. 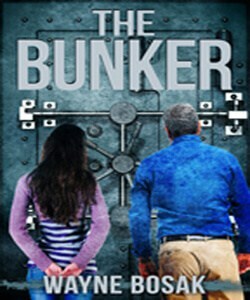 A storage cabinet could even be built onto the wall of the house where the summer kitchen is going to be located to store food preservation tools and supplies. Use all of the wall and ceiling space inside of your outbuildings and garage to create as much storage as possible. Peg boards can be used to store tools and wall mounted racks can be used to hold the handles of gardening and cleaning equipment to avoid the use of valuable floor storage space. No two homesteads or homesteaders are alike. Regardless of the how much land you own or how experienced you are at growing crops and raising animals, there will be trial and error..as well as heartbreaking failures and cherished successes. The recipe for a successful homestead is not dependent upon size but organization efficiency, and commitment. A very well thought out article & well written. I do cringe when I hear the terms “billy” & “nanny” though. Haha Your babies are fortunate to have such a beautiful place to grow up. Wonderful article. Gives people hope that want to remain near suburbs to continue access to stores with new products and medical services. Land prices get more reasonable when one is 20 to 50 miles away. I see you are in “Appalachia” which runs from Pennsylvania to Georgia. The frost free days of the north are approx 100 days whereas in the south it is approx 220 days. Pennsylvania has the same latitude as Northern California which has rather moderate climate in the Central Valley. We are in Northern Idaho which has the same latitude as Lake Superior. The summers are beautiful here, but he winters are harsh near Coeur d’Alene. Harsher further north. People homestead here, but usually larger plots, because the entire area north of CDA is over the Rathdrum Aquifer. For that reason, land occupancy is limited by the health authority. Management of fertile, flat ground is paramount. Some plots have a lot of this land, but harder and harder to find. Thanks for the article. You talk about lawn mower wheels for a moveable chicken coop. Riding mower or push mower wheels?